Jesus Christ is the Good Shepherd. A good shepherd leads and protects his flock, and his sheep know his voice. Lost No More by Greg Olsen. Mormons believe Christ is the Good Shepherd. O ye workers of iniquity; ye that are puffed up in the vain things of the world, ye that have professed to have known the ways of righteousness nevertheless have gone astray, as sheep having no shepherd, notwithstanding a shepherd hath called after you and is still calling after you, but ye will not hearken unto his voice! Therefore, if a man bringeth forth good works he hearkeneth unto the voice of the good shepherd, and he doth follow him; but whosoever bringeth forth evil works, the same becometh a child of the devil, for he hearkeneth unto his voice, and doth follow him. And now I say unto you that the good shepherd doth call after you; and if you will hearken unto his voice he will bring you into his fold, and ye are his sheep; and he commandeth you that ye suffer no ravenous wolf to enter among you, that ye may not be destroyed (Alma 5:37-39, 41, 57, 59-60). 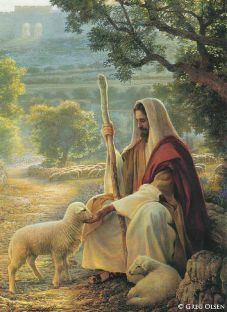 I am the good shepherd: the good shepherd giveth his life for the sheep (John 10:11). Christ, in His role as the God of the Old Testament (Jehovah), chastised the leaders of His children, because they were poor shepherds. Thus saith the Lord God; Behold, I am against the shepherds; and I will require my flock at their hand, and cause them to cease from feeding the flock; neither shall the shepherds feed themselves any more; for I will deliver my flock from their mouth, that they may not be meat for them (Ezekiel 34:2, 5, 7-10). And other sheep I have, which are not of this fold: them also I must bring, and they shall hear my voice; and there shall be one fold, and one shepherd (John 10:16). And verily I say unto you, that ye are they of whom I said: Other sheep I have which are not of this fold; them also I must bring, and they shall hear my voice; and there shall be one fold, and one shepherd (3 Nephi 15:21). And they must come according to the words which shall be established by the mouth of the Lamb; and the words of the Lamb shall be made known in the records of thy seed, as well as in the records of the twelve apostles of the Lamb; wherefore they both shall be established in one; for there is one God and one Shepherd over all the earth (1 Nephi 13:41). And he gathereth his children from the four quarters of the earth; and he numbereth his sheep, and they know him; and there shall be one fold and one shepherd; and he shall feed his sheep, and in him they shall find pasture (1 Nephi 22: 25). During the millennium, all Christ's sheep will constitute one fold. This page was last edited on 27 November 2011, at 01:10.